This article gives an overview of JSP technology. We will learn and cover the JSP Overview, architecture, Life Cycle, Directives, Action Elements and Implicit Objects. JSP stands for JAVA SERVER PAGES. It is a standard java extension used to simplify the creation and management of dynamic web pages. JSP’s allow us to separate the dynamic content of webpage from static presentation content. A JSP page consists of HTML tags and JSP tags. HTML tags are used to create static page content and JSP tags are used to add dynamic content to web pages. JSP pages are compiled into a Java Servlet by a JSP translator. Web pages created using JSP are portable and can be used across multiple platforms without making any changes. Programming in JSP in easier than in Servlets. JSP pages are automatically compiled by servers. Developers need to compile JSP pages when the source code of the JSP page is changed. Most important benefit of JSP is the separation of business logic from presentation logic. JavaBeans contain business logic and JSP pages contain presentation logic. This separation makes an application created in JSP more secure and reusable. JSP pages easily combines static templates like HTML or XML fragments. Before execution, JSP pages are compiled into servlets so we can easily update presentation code. If JSP page is modified, then there is no need to recompile and redeploy the project. We only need to recompile and redeploy the servlet code. It is easy to separate business logic from presentation logic. So JSP can be easily managed. It is easy to learn and easy to implement. JSP environment provides compilation of pages automatically. Servlets cannot be accessed directly whereas a JSP page can be accessed directly as a simple HTML page. As shown in above architecture, web browser directly accesses the JSP page of web container. 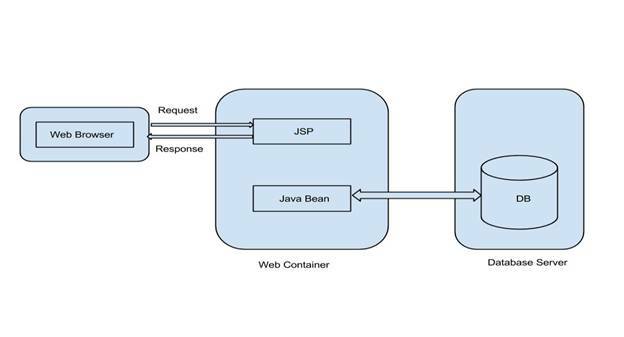 The JSP pages interact with the web container’s JavaBeans which represent the application model. When client sends request from a JSP page, the response is sent back to the client depending on the requests which are invoked by the client request. If response requires accessing the database, the JSP page uses JavaBeans to get data from the database. Translate the JSP to servlet code. Compile the servlet to byte code. JSP Page Translation:In the first step, the web container translates the JSP file into a Java source file that contains a servlet class definition. The web container validates the correctness of JSP pages and tag files. JSP Page Compilation:In the second step, the web container compiles the servlet source code into a Java class file. JSP Page Class Loading:In the third step, the servlet class byte code is loaded into the web container’s JVM software using class loader. JSP Page Servlet Instance:In the fourth step, the web container creates an instance of the servlet class. JSP Page Initialization:In the fifth step, the web container initializes the servlet by calling the jspInit() method. This method is called immediately after the instance gets created. It is called only once during JSP life cycle. JSP Page Service:The initialized servlet can now service the requests. The web container calls the _jspService () method to process the user request. This method is called for every request during its life cycle. This method takes HttpServletRequest and HttpServletResponse parameters. JSP Page Destroyed:When the web container removes the JSP servlet instance from service, it calls jspDestroy () method to allow JSP page to clean up the resources. This is end of the JSP life cycle. This topic defines about basic syntax in Java Server Page such as Scriptlet, Declarative, Expression and Comments. Following example demonstrates use of above scripting elements. Extends: It defines super class of servlet class generated by Jsp page. It is rarely used. //If set to true then EL will not be evaluated. //value of the autoFlush is false. So, the page will not be flushed automatically because buffered size should be with at least 8kb. pageEncoding: It defines character encoding of output stream. The default is ISO-8859-1. JSP include directive: It is used to include contents of files such as JSP file, html file or text file. This happens during translation phase. By using this directive we can reuse the code. JSP taglib directive: It is used to define tag library that defines custom tags. We can use Tag Library Descriptor (TLD) file to define the tags. This directive includes URI and custom tag prefix. The URI is used to specify a location. The prefix is used to distinguish custom tags from libraries. The Action tags are used to control the flow between pages and to be used with Java Bean. We can insert a file, forward one page to another page or we can create HTML page for java plugin. JSP actions are XML tags that control the behavior of the JSP engine. jsp : include It is used to include contents of files such as JSP files, html files or text files. This happens during translation phase. jsp : forward It is used to forward request to another resource or page .It may be html page, JSP page or other resource. <jsp: include> Action Tag:It is used to include files such as JSP, html or servlet. This happens during translation phase. This tag includes file when the page is requested. For example, we will create JSP file called newdate.jsp whose content is included in includeexample.jsp. The following example creates one JSP file called hello.jsp and forward request to date.jsp page. The <jsp: usebean> Action Tag:It is used to instantiate a bean class. It searches for id and scope variables. If object is not created, then it creates the specified object. scope: It represents the scope of the bean instance. Scopes value may be page, request, session, and application. Default scope is page. page: Using this scope a bean is available within a JSP page until page sends response to client or forwards request to another resource. request: It Indicates a bean can be used from any JSP page that is processing the same request until JSP page sends response to the client. session: It indicates that a bean can be used from any JSP page invoked in the same session .The Page in which we create the bean must have page directive with session=”true”. application: It indicates that the bean can be used from any JSP page in the same application. class: It takes class name to create a bean instance if bean instance not present in given scope. It should have no-argument constructor and should not be an abstract class. beanName: It takes class name or expression. type: It takes a class or interface name. This can be used with class or beanName attribute. Example for setProperty and getProperty: Create one java file called example.java. The out object:It is used to send content or output to the client. This object is instance of javax.servlet.jsp.JspWriter. It sends content in a response. The request object:When the client requests a page, the JSP engine creates a new object to that request. It is object of type HttpServletRequest. Now create jsp file as hello.jsp. This file should be the same as the one in html file. The response object:It creates an object to respond to the client. It is an object of type HttpServletResponse. The session object:It is used to set or get session information. A session object is created by the container whenever we request a JSP page. The application object:It is used to get information and attributes in JSP. It also used to forward the request to another resource or to include the response from another resource. The config object:It is used to get configuration message for a jsp page. You can also use it get the init parameter present in web.xml. The pageContext object:It is used to set and get attributes and forward request to other resources. The exception Object:It is used to display exception in jsp error pages. It is an instance of the Throwable’s subclass. It is available only in error pages.